Make your own custom adhesive buttons with button studio. 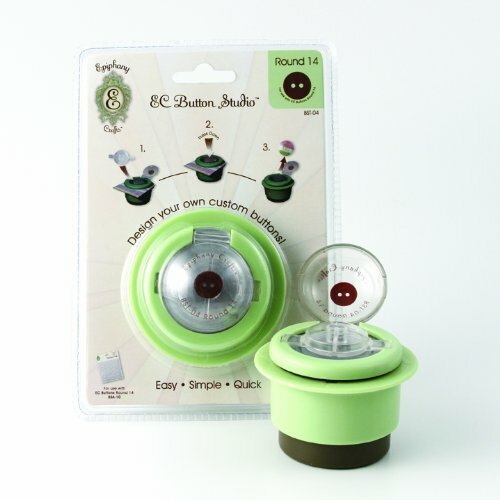 Using button studio acrylic buttons and this button studio tool you can create custom buttons using scrapbook paper you already own. Just insert the paper into the button studio tool, remove the adhesive backing from a button studio acrylic button, place button in the tool and press down. It's so easy. This package contains one button studio tool (measures 2-1/4 by 2-1/4 by 2-1/4-inch). Button studio acrylic buttons not included. Tools come in a variety of shapes and sizes-each sold separately. Imported. View More In Application Tools. If you have any questions about this product by Epiphany Crafts, contact us by completing and submitting the form below. If you are looking for a specif part number, please include it with your message.